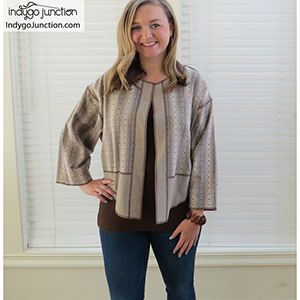 Create a slightly oversized top, tunic or jacket with a shirttail hem. Two lengths included: mid-hip curving a bit longer in front/back & longer hip-length tunic. The sleeve is a modified dolman design that falls to bracelet length. 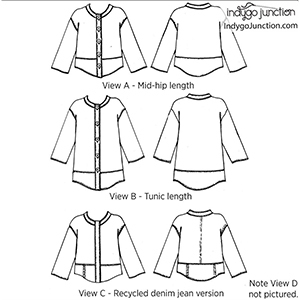 Pattern includes a lengthen/shorten line & instructions for easy alteration to a 3/4 or full length sleeve. We feature it constructed of two contrasting prints and upcycled jeans. Both are shown with a five button closure down the front placket. 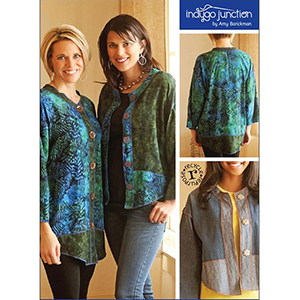 This pattern is available in sizes S to 2XL. Suggested fabrics are vegan leather, french terry or ponte de roma, denim, and medium to heavyweight woven.